The unraveling of the social safety net put in place by the PT, combined with the legislative manipulations and extreme neoliberal austerity constitutes a right-wing coup, explains Mark Weisbrot of CEPR. 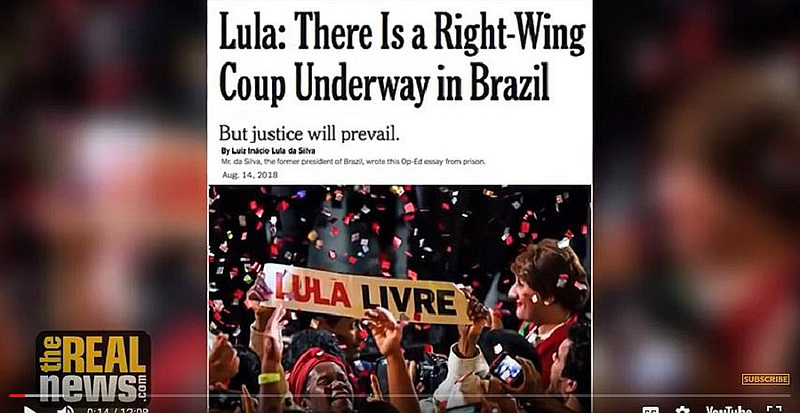 If Lula is not a candidate, the elections will be fraudulent since they will impede a wide section of the people from their right to choose whom they want for the presidency. And the crisis will get worse and we will have four more years of conflict, violence and worsening of social inequalities. vIn order to build a new project of a country for us, with structural reforms in the political sphere, judiciary and in our media and economy, it is necessary to guarantee the participation of Lula in the elections. This is why members of the people’s movements have been on an indefinite hunger strike from July 31. Last Friday, August 10, there was a national mobilization of the workers, called for by all central trade union federations. The rural movements have been participating in a national march towards Brasília and they will reach the capital on Wednesday, August 15, when the candidacy of Lula will be registered. We hope that the judicial power will remember that above their vanities and interests, there is a constitution that has already been violated and undervalued in the last few years; that the judges submit to the will of the people and the Magna Carta, and not to the interests of Rede Globo [the media conglomerate] or to the coup project of big capital.